Sue Johnson, Julie Carlson, and Elizabeth Bower are a unique mother, daughter-in-law,daughter team. 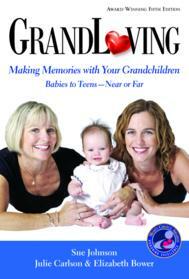 They know first-hand the challenges of long-distance grandparenting, as they all live far fromfamily. All three are moms and former teachers. Sue has run a home business for 30 years, Julie is a freelancewriter and an editor for the university presses at Yale and Harvard, and Elizabeth, the newest member of theteam, brings fresh new insights to the group. This dynamic team writes about family issues for the media andoffers Grandloving seminars and lectures.